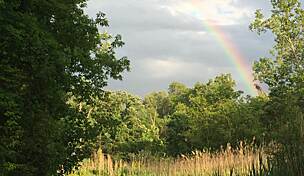 The Milford Trail connects the Village of Milford with the popular Kensington Metropark in Oakland County. 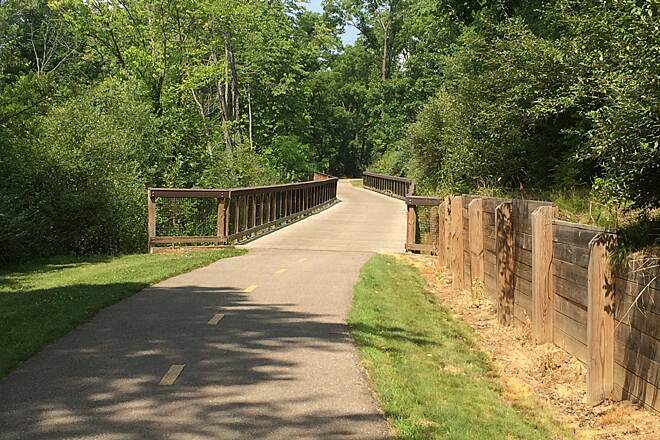 The winding trail offers plenty of scenery as it travels through woodlands and wetlands. 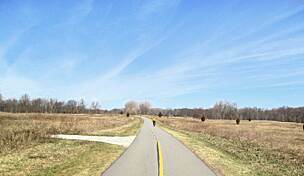 In the north, the trail provides access to Milford’s YMCA and skirts the edge of Hubbell Pond. 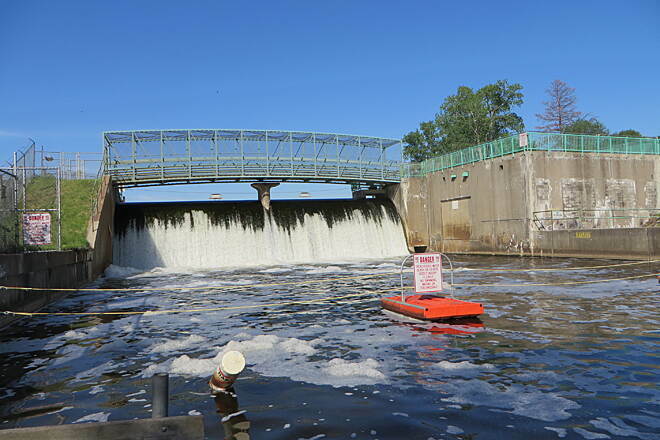 After passing over a dam, the Milford Trail parallels General Motors Road for a short distance, just east of the car company’s sprawling proving grounds. The historic site, still in use by General Motors, was the first facility dedicated to automobile testing when it opened in 1924. 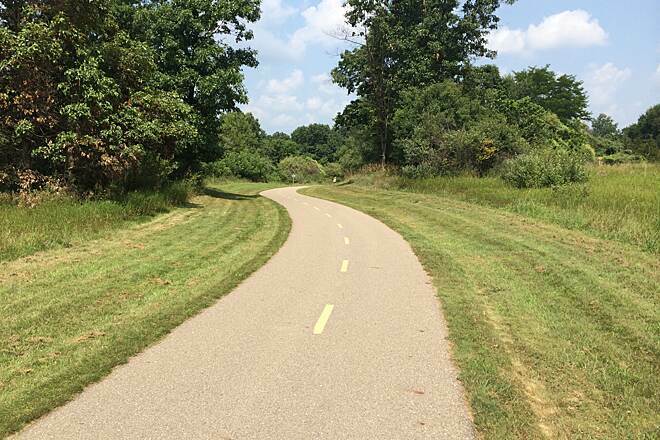 At the trail’s southern endpoint, it meets the Kensington Metropark Trail, which continues into the popular park and around scenic Kent Lake. 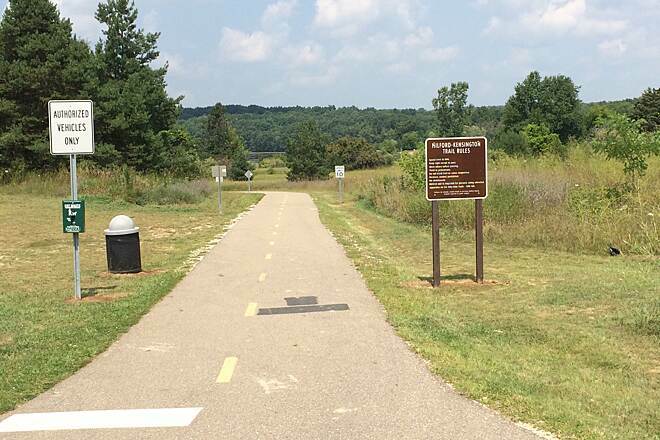 Parking for the Milford Trail is available in Kensington Metropark on Huron River Parkway, just south of the trail's terminus at S. Milford Road. I included this as part of a long ride from South Lyons City Trail, Huron Valley Trail, Island Lake Pathway, Kensington Metropark trail, and Milford Trail to Milford and back. Excellent trail. Good surface, nice variety, pretty scenery. On the Milford end it's difficult to find. My friend said back of the YMCA but there's lots of roads there to various parking areas and the trail is further back still. At the other end there are a couple of Y junctions and it's not clear which to take. Even in Kensington it's not clear where to go. It's in serious need of signs. It's unfortunate because it's a great trail overall. I'm giving it a 4 for the signage problems. 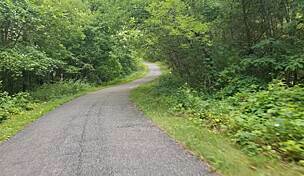 Nice trail with scenic views and connects to many other trails. My wife and I bike this trail often. 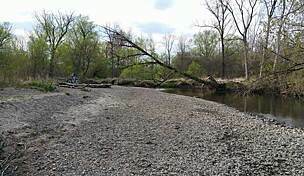 We often start off in the Milford YMCA and take the Milford Trail south to Kensington Metro Park. The Milford Trail portion is short but it leads to the 9.5 mile loop at Kensington. 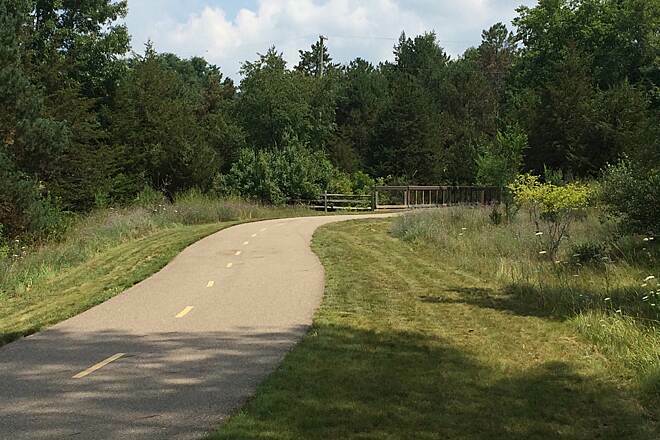 You can connect to the Island Lake State Park Trail at the southern end of the Kensington loop. 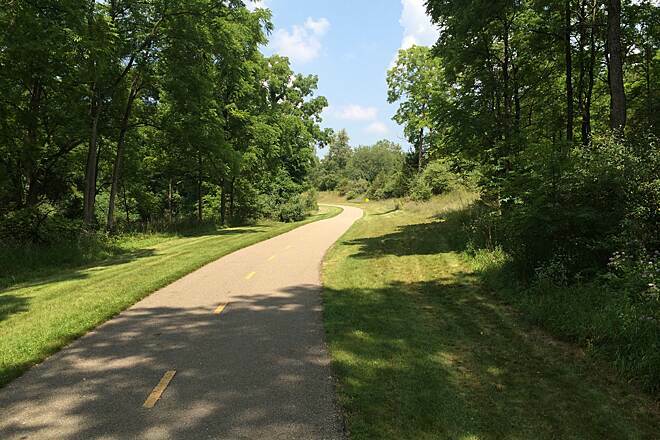 From there you can also connect to the Huron Valley Trail which goes from Wixom the South Lyon (paved Rail-to Trail) via a connecting trail along Grand River Road. 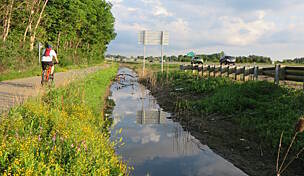 So you have 4.2 miles of the Milford Trail + 9.5 miles of Kensington + 4.3 miles of Island Lake + 10.5 miles of Huron Valley + ~1.5 miles connector = ~30 miles of total trails. The Milford Trail itself is, albeit short, scenic with nice rolling hills in the northern start of the trail. This may be a bit challenging if not in shape but is relatively easy. 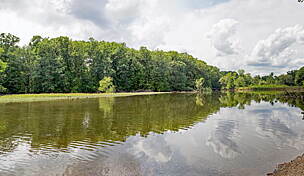 You have nice water views and it snakes through wooded areas which is beautiful in the fall especially. 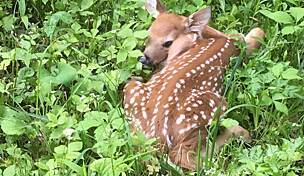 There are meadows in the southern part where you can often catch sight of whitetail deer. There are many points where you can stop and enjoy the scenery or take a break with benches scattered about by the trail. There are nice boardwalk/bridges in a couple parts too and a dam bridge over the pond. 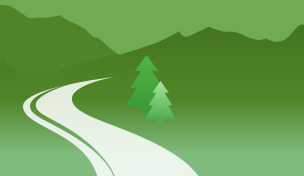 Th trail is paved and fairly wide. You will see walkers, runners, bikers and an occasional skater. 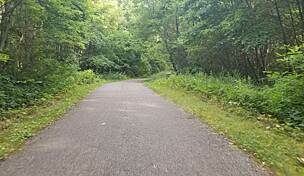 It is great to start off in the morning on this trail and the others that connect to it and then come back and enjoy a lunch in the charming downtown Milford. It really makes for an enjoyable day with a significant other. 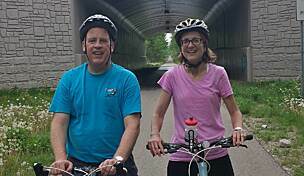 I enjoyed biking with my daughter on the trail between Island State Park and Milford YMCA. 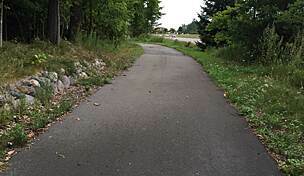 The trail is paved, flat, smooth, well-maintained and easy for kids. The trail is also scenic: beautiful dams and beaches of Kent lake of Milford pond, open field, and woods. 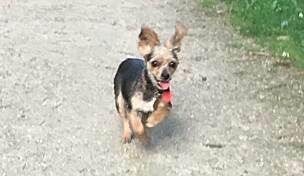 Only one thing I don't like is that too many people in the Kensington Metropark area.